It’s been a few weeks since you made a new year’s resolution to exercise more, but your resolve might be fading by now. Time to get back on your training regimen for some fun races this winter — on feet, skis, bikes and maybe even your hands and knees through a tunnel. Here are five active Colorado events before the spring thaw. This is what your fat bike is made for. 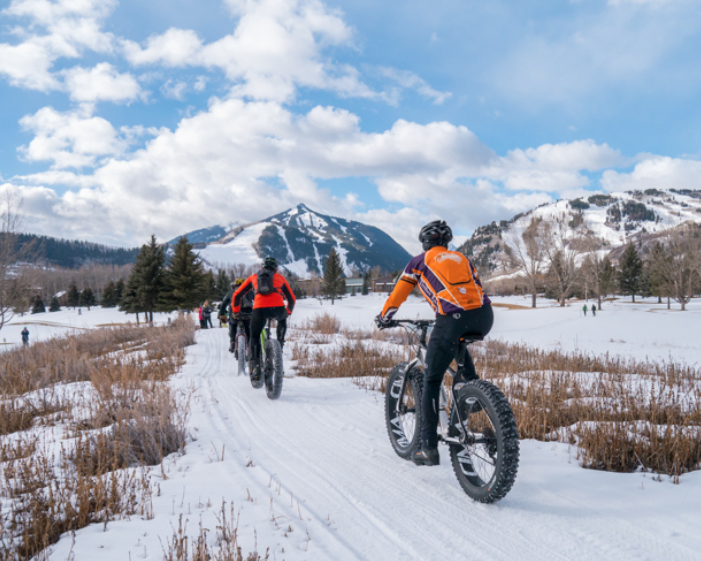 If you have a bike with tires wider than 3.8 inches, race on groomed trails throughout the Aspen Golf Course and Aspen Nordic Center on Saturday, Feb. 2. The open race starts at 9 a.m. for 50 minutes of racing to compete for a $150 first-place prize in the men’s and women’s divisions. The 30-minute rec division starts at 10 a.m. Registration costs $20, including a t-shirt and free food and drink from Red Mountain Grill in Aspen. Click here to register. The highest Nordic skiing marathon in the country begins at 9 a.m. Saturday and Sunday, March 9 and 10, at Snow Mountain Ranch outside Granby. Distances range from 10 kilometers to 50 kilometers, with freestyle races on Saturday, and classic races on Sunday. The Nordic Center is also offering 25K ski tours, and a free 2K race for kids 15 and under. Registration ranges from $25 to $140 and includes lunch at the post-race barbecue. Also, skiers who complete two races will receive a belt buckle. Click here to register. Also, on Feb. 2, the tiny central Colorado town of Como (off U.S. Highway 285 near Fairplay) hosts a “4ish-mile off-road winter adventure run” and obstacle course. Last year’s event included climbing over walls, hauling logs, crawling through a 60-foot snow tunnel and sledding down hills. Registration for the 10:30 a.m. event costs $50, or $60 on the day of the race, with team discounts, and includes coffee, hot cocoa, a fleece hat and a finisher’s medal. Participants are also required to bring their own sled. Kids are also welcome to snowshoe or sled, enjoy hot cocoa and play in a large playground. Click here for details. Finally, Saint Patrick’s Brewing in Littleton is giving you a chance to run off those green beers before you drink them. On Saturday, March 16, deck yourself in green running gear and take to the Platte River Trail. Dogs and strollers are also welcome in the race, and kids under 12 run for free. Additional prizes are also available for finishing the race while carrying a water-filled growler or carrying a keg between two runners. $35 registration fee includes beer, coaster, custom pint glass and fun giveaways. Click here for more information. Fort Collins’ Red Truck Beer Co. hosts a couples’ Valentine-themed race with a twist on Saturday, Feb. 9. It’s a 5-kilometer and 10-kilometer race for men and women, but the women get a three-minute head start for the 5K and a five-minute lead in the 10K. Registration costs $30 for the 5K, and $35 for the 10K, with group and youth discounts. Prices also increase on the day of the race, if any of the 500 race spots are still available. Entry includes a long-sleeve shirt, indoor festivities before and after the race, and free beer at Red Truck. Beers Based on 1964 Stanley Kubrick film classic?